Today a couple of DIY and Food Bloggers are getting together on a virtual potluck to celebrate Katie’s “Virtual” Baby Shower. I have two girls of my own and know about the sleepless nights and tired days. Cooking was not on my to do list and anything easy to prepare was a must. 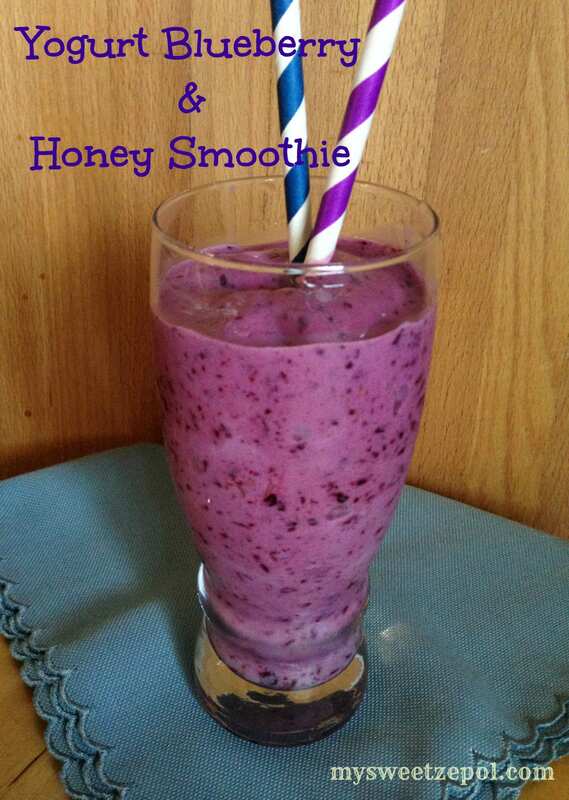 This smoothie is perfect for new moms and busy moms too. It’s a BOY! Katie is having a boy, so I thought that something blue was in order. Today I want to share with Katie and you all a very simple, but yet so satisfying recipe. Yogurt Blueberry and Honey Smoothie is wonderful as a breakfast and works wonders as a late afternoon pick me up. Plus, it’s super healthy too! 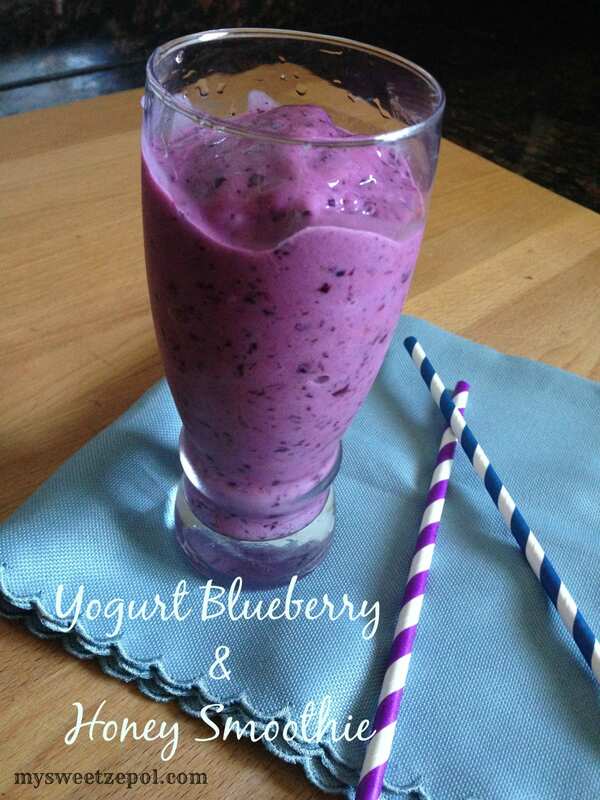 Mix all the ingredients together in a blender or food processor, until well incorporated. How easy was that? You will all love this recipe. I urge you to try it with any fruit of your choice. I met Katie through the food blog community, it didn’t take long for us to become friends. She is a very sweet and kind gal. Katie is also very talented, she cooks and shares her delicious food on her blog Katie’s Cucina. She does more, she is also super crafty and creative and blogs about it with her husband John at Sew Woodsy. Go check all of Katie’s talent, I’m sure you’ll be inspired to cook up something scrumptious or create an easy craft. My prayers for Katie and John is for them to enjoy the birth of their first baby boy. Parenthood is a beautiful and magical blessing. It is an honor to be a part of their baby boy’s celebration and be able to experience their joy. Katie’s virtual baby shower was a collaboration of many amazing bloggers, both food and DIY/craft bloggers. Check out the many amazing easy recipes and DIY/crafts Katie’s friends made for her. A big shout out to Julie (from The Little Kitchen) and Christine (from Cook the Story) for putting this lovely Virtual Baby Shower for Katie. You girls rock! @Liz, I’m glad you like it. This is an amazing fast and healthy breakfast, great for “on the go” days and for kids when rushing to go to school. We love it! Looks so bright and tasty! Thanks for joining us today to celebrate Katie! Christine, you are so sweet. Thank you for putting this virtual potluck together with Julie. You girls rock! Thank you for your sweet comment, hugs! Aww, my dear Katie, I have become so fond of you through out the years. You are a very special friend. You will be an amazing mamma (I know, I have told you this already, but I believe it with all my heart). It is an honor to be a part of your story. Hugs dear girly. Ricky, the blueberries are local too. From Lake Catherine Blueberries, check them out when you have a chance you’ll love them. Mmm, this looks so thick and creamy! Love it! Thanks Caroline, it’s the perfect consistency to be a good breakfast or afternoon treat. Almost a meal. Nothing better than a colorful smoothie! Thank you Leslie. The color is beautiful indeed. Thank you. This looks awesome, Wanda! Thanks so much for joining in on the shower for Katie! Thank you Julie, it was an honor to be invited to be a part of Katie’s baby shower. She is a darling and a sweet friend. Hugs! 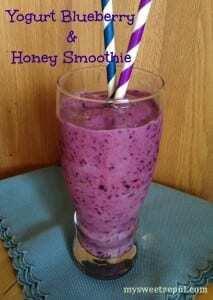 Just tried this smoothie, delish. Thank you Wanda. 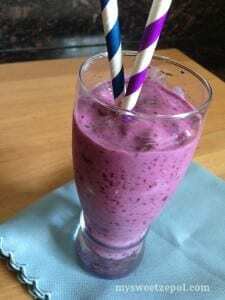 Carmencita, I am so happy you gave this smoothie a try. Thank you. It is insanely good,refreshing and satisfying.